Can a world-weary vet keep his small town together when aliens arrive? Richard Helms doesn’t believe he deserves to be happy. His new business, the Bottom of the Hill Bar and Grill, is booming. There’s even the possibility of a romance with the local veterinarian who helped him nurse his pet raccoon back to health. But for the 32-year-old war vet, permanently injured by a roadside bomb, all this success and happiness is too much. Richard just wants to see his friends happy and healthy without him. So when an alien invasion turns his small town of Hollow Hills, Ohio, into a hotbed of corruption and violence, Richard is sure this is the perfect time to go out in a blaze of glory. But nothing is that easy when aliens come calling. The Legion Under the Hill is the first book in Sawyer Black’s new Legion series, set in the bestselling Invasion Universe. 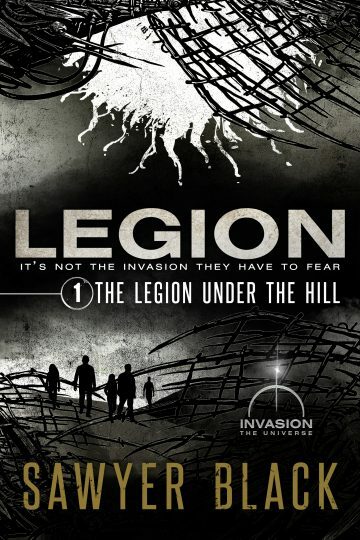 If you are looking for a grim, action-packed thrill ride reminiscent of Under the Dome and Alien Nation, you’ll love The Legion Under the Hill. Pick up your copy today!